Do you have a favorite TV show or song.? What about a favorite person.? Naming a sport or song is easy but admitting you have a favorite person may be hard to do if you have more than one best friend in the room with you. In James 2:1-13 we learn that having a favorite song or sports team is one thing, but playing favorites with people is another. 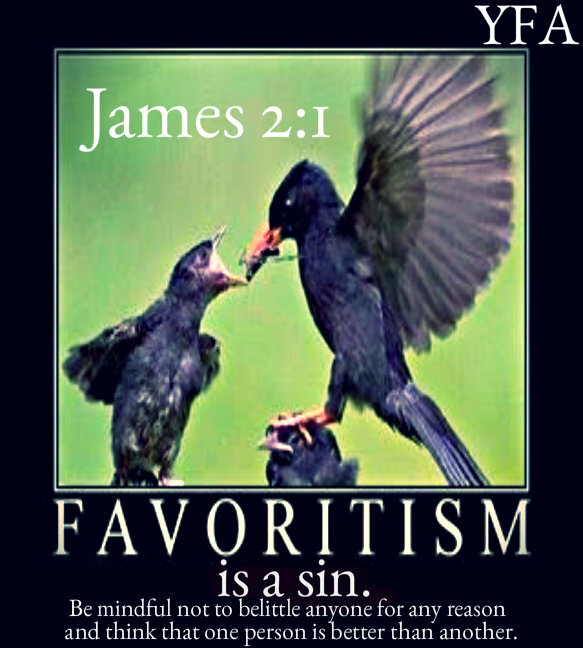 Showing favoritism to anyone for any reason is a sin and it only leads to conflict and trouble. Those who are shown favoritism will start thinking they are better than others. Which leads to resentment from others and will eventually cause others to become bitter toward those who are shown favoritism. How many have you hurt by showing favoritism? God is not a respecter of persons and we should not be either. -Acts 10.34-35 I’m not saying that you can’t have a close group of friends, everyone does. It’s not even talking about cliques, that is a separate issue. Friendships are built with time, trust and commonality. What the scripture in James is talking about is how you treat “outsiders,” people you don’t know well and who don’t know you. -James 2:2-7 Also, be mindful not to belittle anyone for any reason and think that one person is better than another. Always treat others the way you would want to be treated and love others as yourself. Father God, I realize that favoritism is a sin, I know there have been times in life I have considered myself better than others, forgive me for valuing people with wrong judgment, and for showing favoritism. Give me your eyes to see others, your heart to love others,your kindness to share with others, thank you for not overlooking me and for forgiving me of my shortcomings. I love you In Your Name I pray, Amen.